THE SYSTEM HAS WINDS HAVE INTENSIFIED TO 50 KNOTS, AND WITH CORE PRESSURE OF 985mb,"EYE" FORMATION IS BECOMING IMMINENT. MUMBAI IS GETTING MODERATE RAIN SINCE YESTERDAY. WITH THE DAY PROGRESSING ON WEDNESSDAY, THE RAINFALL WILL INCREASE, AND STORMY WAVES EXPECTED ON THE COASTLINE WEDNESSDAY EVENING. HEAVY RAINFALL OVER 100mms EXPECTED IN MUMBAI. PUNE/NASIK ARE EXPECTED TO GET HEAVY RAINS ON WEDNESSDAY, AND REGIONS OF MADHYA MAHARASHTRA WILL RECIEVE VERY HEAVY RAINS. 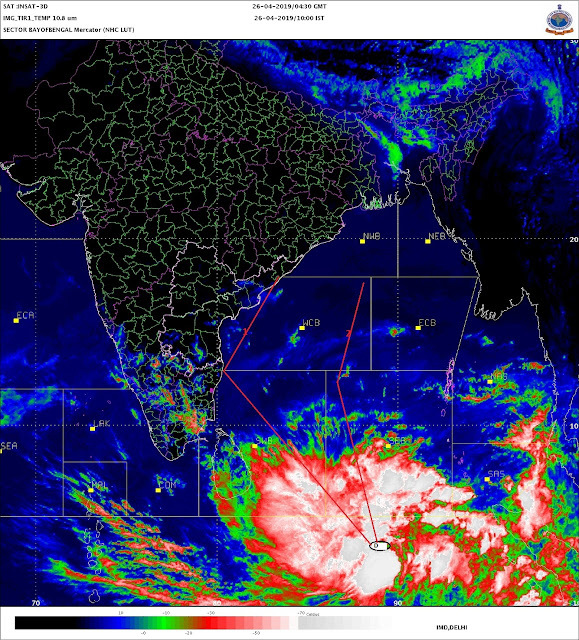 COASTAL MAHARASHTRA AND SOUTH GUJARAT COAST WILL BEAR THE MAIN BRUNT ON WEDNESSDAY/THURSDAY.